So said Ritchie Mendoza of Cebu Events Maker when he handled the wedding of Cebu-based jeweler Miranda Konstantinidou at the Ocean Pavilion in Shangri-la Mactan. Cebu Events Maker is a member of the Association of Sugbu’s Wedding Planners and Coordinators, Inc (ASWPC). And yes, the wedding industry in Cebu has gotten so big that wedding planners had to form their own association. The City’s wedding planners got together to organize events promoting the wedding industry, share trade secrets, and simply get to know one another. The news is in: complicated weddings are no problem with these wedding planners at the helm. Did you know that the Cebu archdiocese has new guidelines for church weddings? They call it “trimming the unnecessary parts.” Archdiocese officials came up with new rules implemented last Easter Sunday of 2007 to do away with numerous extras not supposed to be included in the liturgy. Liturgical coordinator Roland Cabiluna espoused simplicity and did away with “theatrical” moments by limiting wedding ceremonies from 45 minutes to one hour only in all parishes under the Archdiocesse of Cebu. Moreover, church wedding participants, down to the ring bearers and flower girls, should only be those who have been baptized and have received the first communion. Official lectors and psalmists are also the only ones allowed to read the scripture reading, carefully chosen by the couple after reflection and discussions with the priests. Making your own vows won’t be a problem in Cebu as own or reworded vows from the Rite of Marriage are not allowed. The same goes for popular and secular music within the church buildings. The Fashion Council of Cebu also better heed the new guidelines since gowns and dresses should cover the shoulders and back of the bride. It must also fall below the knees, and must not have slits. Bid adieu to rice, birdseed, confetti and petals thrown within church grounds. Arcs and canopies in the sanctuary and church entrance are also discouraged. 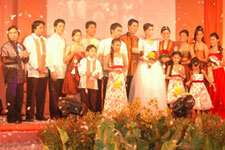 Did you know that Cebu has its own share of wedding dramas? Newspapers fell into frenzy over a human interest piece like that of a bride-to-be this year. Suing would-be husband close to P500,000 in actual damages (expenses incurred during the wedding, moral damages and attorney’s fees) for leaving her at the altar, Gaviola recounted how a girl shouted at the priest to stop the wedding just when the priest asked the guy if he would take her to be his lawfully wedded wife. In the end, after a few months, the girl dropped the charges. 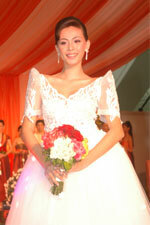 Did you know that Cebu’s popular wedding month is May? Cebu is also not excluded from nationwide trends. According to the National Statistics office, May, and not June is the wedding month for Filipinos. Most couples get married before a judge or politician in the month of May, the month of flowers and festivals, when the fiesta season rolls around. December ranks second, followed by January. See? June didn’t even make it to the top three! . . . . . . .. . . . . . . . . . . . . . . . . . . . . . . . . . . . . . . . . . . . . . . . . . . . . . . . . . . . . . . . . . . . . . . . .